Leffe is perhaps the best known Belgian brand in the UK, with their Blond and Brune, at least, being readily available in supermarkets. 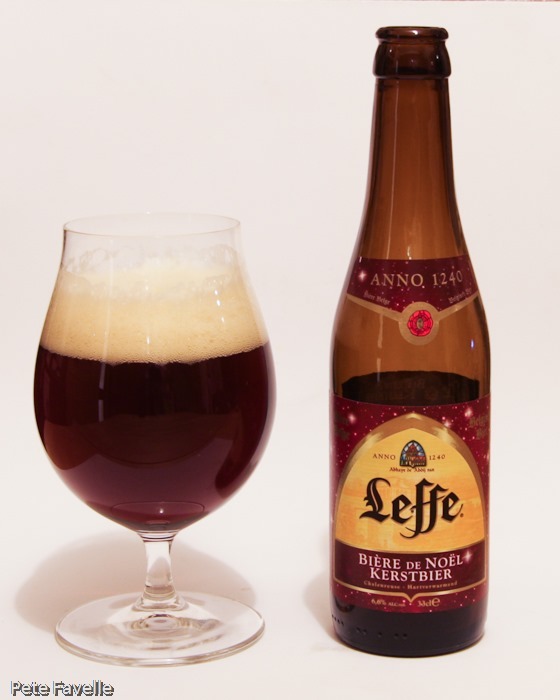 This is Leffe Christmas, a 6.6% ABV seasonal Kerstbier that I’ve not come across before. It’s a dark, reddish amber beer with a decent fluffy off-white head on it. The nose is fruity with a touch of banana, a little sweet and with some gently warming Christmassy spices. Underneath there’s a nicely biscuity malt backbone. It’s foamy and sweet in the mouth, with an acidity that is carried on the slightly overwhelming bubbles. The biscuit malt is fighting it’s way through that, along with a spicy bitterness that lingers well on the back of your tongue. The overly fizzy nature makes this a little harsh, but it’s tasty and has a distinctly festive character – 3 stars. Many thanks to Belgian Beerz for providing this year’s Twelve Beers Of Christmas!